…so now may every man be his own statue. Every man is his best biographer. This is a truth, whose recognition has been followed by volumes of most delightful instruction. Auto-Icon – is a word I have created. Jeremy Bentham, philosopher and social reformer, gave clear instructions in his will for the treatment of his body post-mortem. When he died, which he did in 1832, his ‘dear friend’ Doctor Southwood Smith was to ‘take my body under his charge and take the requisite and appropriate measures for the disposal and preservation of the several parts of my bodily frame in the manner expressed in the paper annexed to this my will and at the top of which I have written Auto Icon’. He was to be dissected and his head preserved ‘in the manner of the New Zealanders’. Then his skeleton was to be clad, with his mummified head atop, and displayed in a wooden case, ‘in the attitude in which I am sitting when engaged in thought in the course of time employed in writing’. He coined the term ‘Auto-Icon’ for his transmuted body. 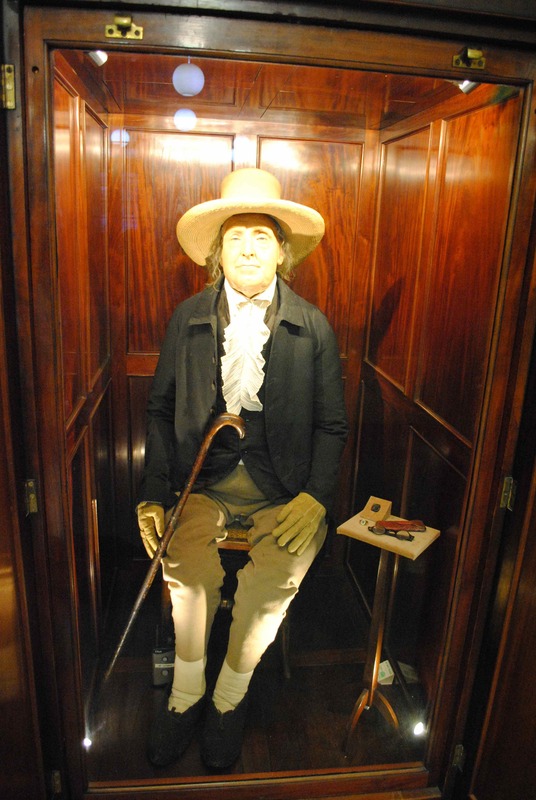 Bentham’s Auto-Icon can be found in University College London’s Wilkins Building, brightly lit and seated in a grand wooden case, displayed like an exhibit in a Victorian natural history museum. He (should I even use the pronoun ‘he’?) looks as neat as a pin in his hat and gloves, his walking stick propped against his knee, his writing instruments on a tiny table close by. Quite the Enlightenment gentleman, at ease in his symbolic after-life. 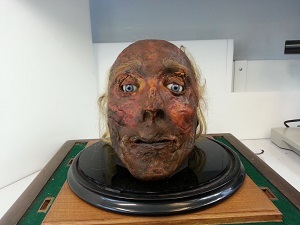 Unfortunately Bentham’s head did not come of out the preservation process looking very well and it was replaced with a wax model. The original was also on display for many years until, after several kidnappings by students, it was placed in more secure storage. It currently resides in a climate-controlled area of the UCL Institute of Archaeology. There are several myths about the Auto-Icon, most of which are debunked on the UCL website, but there’s no doubt that the figure is regarded by the institution as something more than just a model of a dead man. Bentham was a rationalist and an atheist. He thought it important that scientists and physicians had a steady stream of bodies for dissection and study. But in a work published posthumously, Auto-Icon; Or, Farther Uses of the Dead to the Living, he also argued that the large-scale adoption of Auto-Iconism would have environmental and cultural benefits: ’there would no longer be needed monuments of stone or marble, – there would be no danger to health from the accumulating of corpses, – and the use of churchyards would gradually be done away’. The practice ‘would diminish the horrors of death, by getting rid of its deformities: it would leave the agreeable associations, and disperse the disagreeable’. Perhaps not entirely seriously, he also asserted that Auto-Icons would make attractive garden ornaments. The literal meaning of auto-icon is self-image. I wonder why he chose this term. Surely even a materialist like Bentham would have accepted that there is more to the self than one’s skin, flesh and bones. Does the Auto-Icon in some way preserve the self and not just the body? However detached and rational you try to be, there is something unsettling about coming face to face with the figure in the cabinet. Far from providing reassurance about the state of death it seems, in some inexplicable way, to flout it. In his paper on ‘The Uncanny’, Sigmund Freud postulated that the sense of uncanniness arises when we encounter something familiar which, through repression or ‘surmounting’, has become unfamiliar. Interestingly, he cites the severed head as an example of this, ‘springing from’ the repression of castration anxiety. He argued that ‘primitive’ forms of thought, such as the notion of the dead coming to life, although ‘surmounted’ in everyday life, can seem, in certain circumstances not impossible, leading to the feeling of uncanniness. Whatever you think of Freud’s theory, meeting Bentham’s Auto-Icon provokes a genuine sense of the uncanny.